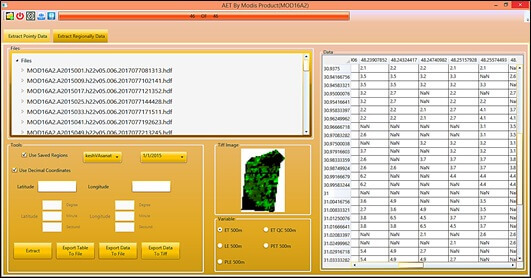 MOD16A2 Data Extractor is a tool for extracting data from HDF files of MODIS product. 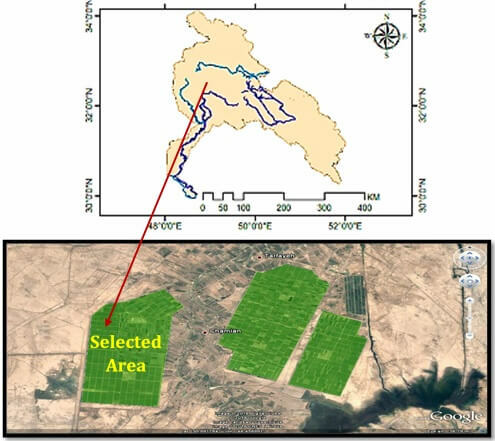 The MODIS global evapotranspiration namely MOD16 is an operational ET product for the global vegetated land areas available from the year 2001 until now. The MOD16 product includes actual evapotranspiration (AET), latent heat flux (LE), potential evapotranspiration (PET) and potential latent heat flux (PLE) datasets at 1 km spatial resolution, for 8-day, monthly and annual intervals. These datasets are produced using the MOD16 ET algorithm by Mu et al. (2007, 2011) that is based on the work of Cleugh et al. (2007). The 8-day ET is the sum of ET during these 8-day time periods. The MOD16 ET algorithm runs at daily basis and temporally, daily ET is the sum of ET from daytime and night. Vertically, ET is the sum of water vapor fluxes from soil evaporation, wet canopy evaporation and plant transpiration at dry canopy surface (Running et al., 2017). How can we use MOD16A2 Data Extractor? 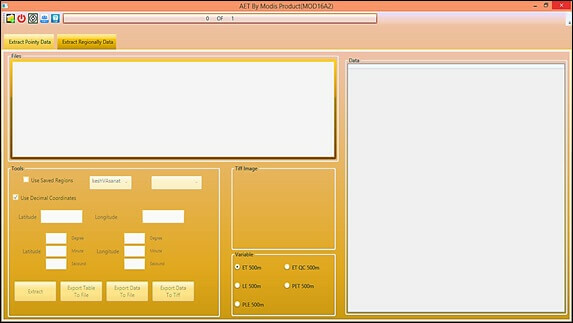 MOD16A2 Data Extractor is a tool for extracting data from MODIS HDF files of product. 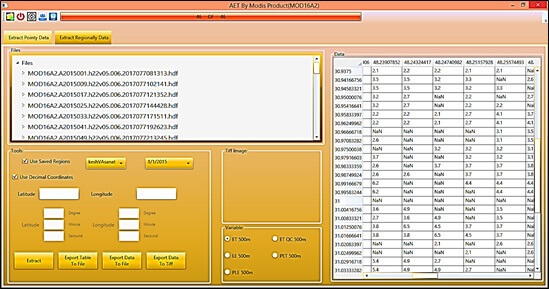 In the developed tool (MOD16A2 Data Extractor) we have tried to put all the variables which produced through MOD16A2 for extracting, and the user can easily apply the tool for extracting the data of a point or a specific region. Fig. 1 shows the example region that we select in using the tool but you can change it to any region. Fig. 2 shows the main screen of the tool. In the variable section, the user can select the aimed variable. In this sample, the AET was selected. For introducing a region the user should create the desirable area by clicking on the map or defining each of the points of the area by entering the latitude and longitude of the region. In the Fig. 3, a selected region was defined and the user can see a table of all values of the AET and as well he/she can understand which point belongs to the selected area or no. The “True” value represents that the point belongs and the “False” value shows it does not belong. As well, Fig. 4 presents all the hdf files and the user can select the main files which belong to the selected area. Fig. 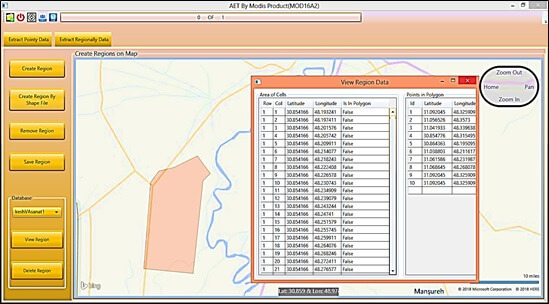 3 - Create a region on the map for extracting MOD16A2 data. Fig. 4 - Load the hdf files of the selected region from MOD16A2 data. In Fig. 5 by loading and saving data and the selected region the user can see the figure of the selected region in the “Tiff Image” panel (Fig. 5). Fig. 5 - All the AET data of the selected region is presented in the right table.